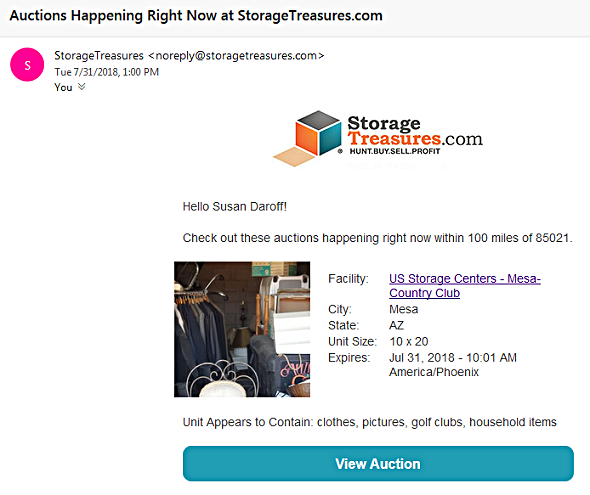 New feature that provides the ability to set search parameters for auction email notifications. A bidder can select which day(s) of the week for auctions happening near, by setting a zip code + radius selection tool. Login to StorageTreasures.com > My Account > Settings > Notifications > select. Click on > + Add New > Auction in a Specific area > “Add an Auction Notification” set your search parameters > Save. 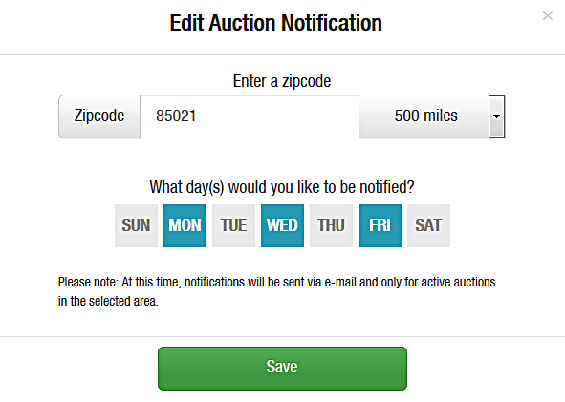 Feel free to add additional auction notifications for a different Zip Code or different days of the week. To edit your notifications, click on the blue pencil to the right of your search parameters. My Account > Settings > Notifications > Blue Trash Can > “Are you sure you want to remove this notifications?” > Yes.